Matteo Sommacal was born in Roma, Italy, in 1977. He splits his creativity between music and mathematics. He was introduced as a child to ancient music and recorder, which later on inspired him to pursue extensive research of Renaissance and Baroque repertoire. The meeting with Carmelo Piccolo, professor at the Conservatorio Statale di Musica “Gioachino Rossini”, was a turning point of his musical career: through Piccolo, he discovered the freedom and beauty of the language of modern music and began focussing his studies in composition and piano. A mathematician as well, he was ultimately attracted to the disciplined, highly structured and near scientific treatment of the musical material typical of many minimalist and postminimalist composers. Since late 2000, he has been serving as the artistic director of the Italian chamber ensemble Piccola Accademia degli Specchi, that premiered and recorded several of his compositions. His works are regularly performed in Italy and major festivals dedicated to contemporary music, as well as being regularly featured in international radio shows, such as John Schaefer's New Sounds on WNYC in the U.S. and Concertzender in the Netherlands. His music has been released on Italian and international record labels, including KHA Records and Centaur Records. 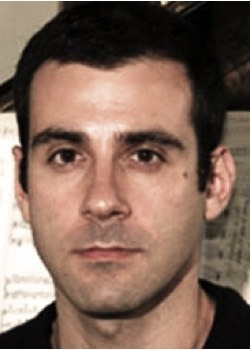 His scores are published by KHA and Casa Musicale Sonzogno. As a scientist, his main research is in the field of nonlinear evolution equations and dynamical systems. After an MSc in Physics and a PhD in Mathematical-Physics at the International School for Advanced Studies in Trieste, he lived and worked in Italy, France, the United States, and the United Kingdom. He is currently Senior Lecturer in Applied Mathematics at Northumbria University in Newcastle upon Tyne, UK.